Founded in 1987 by Australian Glen Moroney, parent company Scenic (then known as Scenic Tours) began by offering coach trips to the Australian coast, originally aimed at Melbourne's senior citizen homes. Since then, the company has grown to include theater and special event tours and has expanded its operations to Norfolk Island, New Zealand, Canada, the United States, South America, South Africa and China. More North Americans than Australians now take the land tours Down Under. In 2007, Scenic opened offices in United Kingdom and Canada, eventually coming to the U.S. 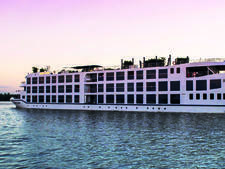 The company's inaugural river cruise season followed in 2008 with the launch of its first riverboat, Scenic Sapphire. 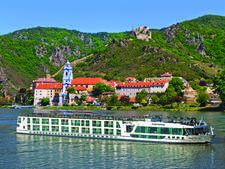 The river cruise division has enjoyed rapid growth; today, Scenic Cruises operates 16 river ships in Europe and Asia. In 2019 the line will debut its first ocean cruise ship, Scenic Eclipse, which will cruise worldwide. Sister ship Scenic Eclipse II is set to be delivered in 2020. 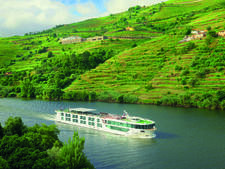 Scenic's river cruises are fully all-inclusive trips, with fares covering meals, gratuities and shore excursions. The line also throws in unlimited drinks (including those from the stateroom minibars) and butler service for all passengers. Additionally, electronically assisted bicycles, to make pedaling easier, are provided for use between certain points on the rivers. Scenic calls its vessels "space ships" to emphasize a higher-than-usual space ratio. Offering an upscale river cruise experience in contemporary surroundings (think W Hotels crossed with a nice chain hotel), a cruise on Scenic is otherwise quite traditional in terms of dining, entertainment and shore adventures. Evening meals are served in the open seating of Crystal Dining. Additionally, Scenic offers two separate evening dining venues by reservation - Portobello's which features fine Italian cuisine and Table Le Rive, which offers a six-course tasting menu served with wine pairings. Occasionally, a barbecue or picnic-fare lunch will be served on the sun deck. Room service is available for all passengers, 24 hours a day. All menu selections include regional cuisine, with some lunches or dinners devoted to the local country. The River Cafe serves sweet and savory nibbles all day; options include hot and cold breakfast items, brick oven pizza, wraps, sandwiches, French fries and patisserie, gelato (Italian ice cream) and the occasional high tea in the lounge. A Starbucks-like coffee machine with a variety of baked sweets is in the otherwise-traditional lounge. As mentioned, all drinks are included in the cruise fares. Each of Scenic's ships has two lounges. Panorama Lounge and Bar offers after-dinner music and dancing and is the venue for the daily port talk. Some evenings, Scenic Cruises brings aboard performers who showcase local culture. Entertainment may include a gypsy troupe, a classical musical recital or a group of traditional Bavarian performers. The other area for enjoying a drink or snack from the River Cafe is the Riverview Terrace, a covered, open-air teak deck at the bow of the ship. This area, seating about 20, is one deck below the ship-length open Sun Deck. The top deck features tables, chairs and chaises, most of which are under canopies or umbrellas. Scenic's newest ships have a vitality pool on the sun deck. About 84 percent of cabins have true balconies with seating for two -- and all ships except Tsar have been retrofitted to include "Sun Lounge" balconies (in essence, retractable glass windows that fold out to open the cabins to some fresh air). All accommodations have flat-screen televisions, bathrobes and slippers and a complimentary minibar that is restocked daily. Scenic's bathrooms, larger than average in most cabin categories, have fun lighting; you can choose a changing spectrum of colored shower lights. English-speaking local guides lead shore excursions, which are also included in fares. Innovative GPS-activated headsets, called Scenic Tailormade, allow passengers to hear the commentary or to choose any of dozens of pre-recorded tours as they walk or cycle through the towns they visit. The Tailormade also has a screen that shows both a map of the route and photos of the specific sights being discussed. Excursion options include ScenicEnrich, which focuses on cultural experiences (live classical music and ballet performances in a Viennese Palace, for instance), and the more typical ScenicFreeChoice (multiple tour options in a single port). Scenic attracts a well-traveled, somewhat affluent crowd of passengers with an average age of 68. The company markets its cruises only in English-speaking countries; about 40 percent of a ship's typical passenger complement is Australian, 05 percent is from the U.K., 20 percent from Canada and 20 percent from the U.S. According to the line, the longer itineraries carry a majority of Australian passengers, and the short itineraries feature a majority of Brits and North Americans. Scenic has 16 river ships in Europe and Asia, and in August 2019 will launch its first ocean cruise ship, Scenic Eclipse, a luxurious, 228-passenger super yacht capable of cruising to all seven continents. Scenic Sapphire, the line's first purpose-built riverboat, was launched in 2008. Since then, a dozen other Europe-based ships have debuted, including the first to be purpose-built for the Douro in Portugal, Scenic Azure, launched in 2016. Others include Scenic Jasper, Scenic Opal, Scenic Amber, Scenic Gem, Scenic Jewel, Scenic Crystal, Scenic Pearl, Scenic Diamond, Scenic Ruby, Scenic Jade and Scenic Emerald. 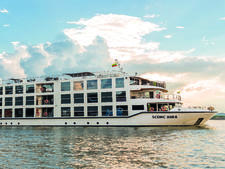 2016 also saw the launch of the Scenic Spirit on the Mekong River and the Scenic Aura on the Irrawaddy River in Myanmar. 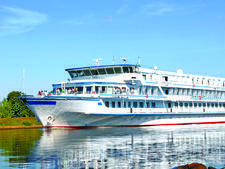 In 2012, the line added its first Russia-based riverboat, Scenic Tsar. This ship, carrying only 112 passengers, is not part of the "space ship" series of vessels, but it was significantly updated and refurbished before its launch. A subsidiary offering less-expensive, less-inclusive cruises on two new ships was launched in 2014 as Emerald Waterways. That line has now expanded. Cruise itineraries range from eight to 30 nights and cover the Danube, Rhine, Moselle, Douro, Mekong and Irrawaddy rivers, the canals of Amsterdam and the Black Sea. Passengers can extend European trips with pre- or post-cruise options, including four-night stays in Prague, London or Paris. In Asia, extensions are available in Vietnam, Laos, Cambodia and Myanmar. The line's upcoming ocean ship, Scenic Eclipse, will embark on its maiden voyage from Istanbul to Venice before sailing in the rest of Europe and the Mediterranean, the Americas, Antarctica, the Arctic and Norwegian fjords.